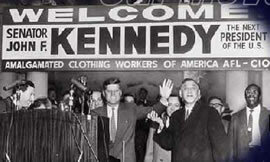 AFL-CIO unions contributed to John F. Kennedy’s success in winning the 1960 presidential election. Labor unions have long been actively involved in American politics. Over the years unions have used their money and manpower to support political candidates who are sympathetic to labor causes. By the early 1950s labor, which had strongly supported the election of Franklin Roosevelt and Harry S. Truman in the 1940s, had made itself an important player within the Democratic Party. The close relationship between labor and the Democratic Party on the national level peaked in the 1960s, when labor unions overwhelmingly supported the presidential candidacies of Lyndon Johnson and Hubert Humphrey. Click on PICTURES below to see an additional photo of major labor leader A. Philip Randolph with President Johnson, about 1966.